Little House on the Lake Great place, great price! We invite you to come and 'get-away' for a week (or two) at this cozy home located on a 1/2 acre of lakefront property and situated at the end of a quiet residential street. Our summer cottage is family owned and operated and we believe in greeting all of our guests and making you feel right at home. 'Little House on the Lake' is the perfect retreat for a small family or adults vacationing together. A beautiful view of Lake Erie can be seen just out the front door and the large open yard is perfect for various summertime activities. Docks are also available to rent for our boat owning guests. They are located within walking distance from the home as well as a free public boat ramp less than 2 minutes away. Not a boat owner? Don't worry, we are also conveniently located between the many boat ferries if you choose others to navigate the sea for you. A better location for summertime fun cannot be found! 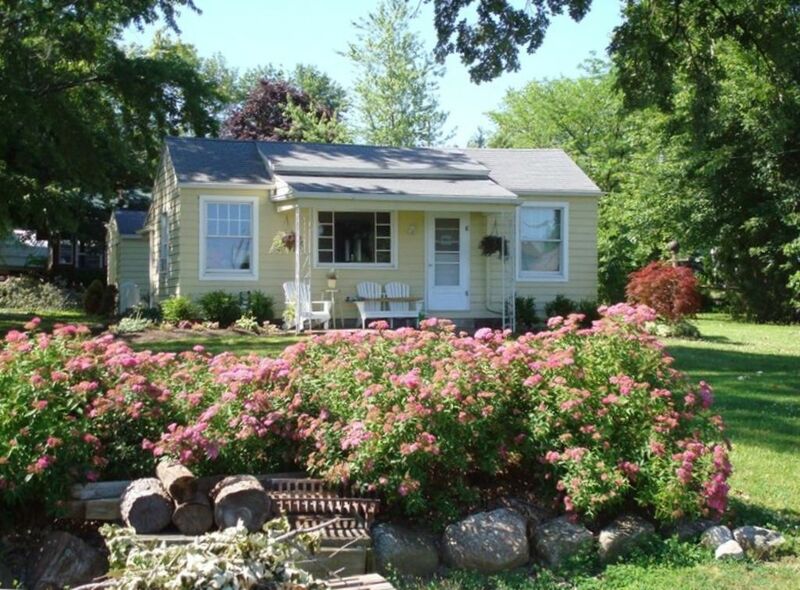 Our 'Little House on the Lake' is only a few miles from the famous Marblehead Lighthouse. We are also close to area beaches, restaurants and 'Monsoon Lagoon' the most cost effective outdoor waterpark around. It takes approximately 30 minutes for our guests to get to Cedar Point & Soak City by car and the Erie Islands; Kelley's, Middle Bass, South Bass (Put-in-Bay) and Pelee by boat. If you need a break from the Lake, why not go shopping? Local businesses offer some other great catches as well. We are 5 minutes from the quaint downtown city of Marblehead which features numerous little specialty shoppes. Shop while you walk along side a beautiful view of the Lake. The quiet and relaxing Lakeside community is also within an arm's reach of our place. Hours can be spent enjoying the countless activities going on inside their gates. Fishermen: check out the 'Western Basin' known for the most productive fishing on the Great Lakes. Walleye, Perch and Bass can be caught in large numbers throughout the year. Many of our guests have caught their fill of fish without even leaving the front yard! Sunbathers or swimmers: if you are brave, jump into the water & sandy area right in the front yard or visit the nearby beach if you prefer for plenty of fun in the sun. Activity seeking visitors: play a game of volleyball or golf, hike, run, boat or just site see and take in the many beautiful sights of this region. Tastetesting folks: fill your bellies with a different kind of food every night - Italian, Mexican, Chinese, Japanese, vegetarian or visit the steak houses, sports bars, fish and chips spots, wineries, mom and pops homemade food joints or even the beloved chili dog and ice cream quick stop. For the rest of you: just kick back, relax and enjoy a good book by the water's edge. We must note - if you are looking for fancy, we are not the place for you. If, however, you want something clean, quiet, cozy and relaxing... we are just that. We also realize that during hard economic times most folks do not have money to throw around. Instead of charging some outrageous price for the week like many others do, we offer our home at a very reasonable rate. We encourage you to go ahead and compare... we bet you will not find another house on the water with so much to do at such a low price. This is why we believe many of our guests return again and again. Locally owned and operated since 2001. The place has been in the family since the 60's. We lived there while our daughters were small until we decided to start sharing the magnificent place with others. It's quiet, private, beautiful and allows one to relax & rejuvenate for a week. It is located right on the water. You can see the islands in every direction and fish without leaving the yard. Covered Porch overlooking Lake with sandy area right out front, Half acre Yard for other activities such as volleyball, lawn darts, sunbathing & fishing, Lawn & Beach Chairs, Rafts, Etc, House is fully stocked with all the basic necessities, (Clean linens, garbage bags, cooking utensils, foil, )You only need to bring your clothes and yourself!